First Blood Author David Morrell Sensationally Smashes onto Historical Thriller Scene with Murder as a Fine Art | Oh, for the HOOK of a BOOK! Murder as a Fine Art, a novel of 1854 London, took author David Morrell out of his usual sub-genre of thrillers (he’s commonly known as the father of the modern action novel since publishing First Blood–the novel that started the Rambo movie series with Sylvester Stallone–in 1972) and into a new realm (and time) of literature. He tried his hand at creating a historical crime thriller with Murder as a Fine Art and he practically perfected it on his first try! However, I never doubted that this book would not also be as fantastic as his others. He’s the type of author that completely immerses himself in his research, throughly detailing each aspect, and creates with vivid images and superb dramatic sequences an entertaining and intelligent novel. 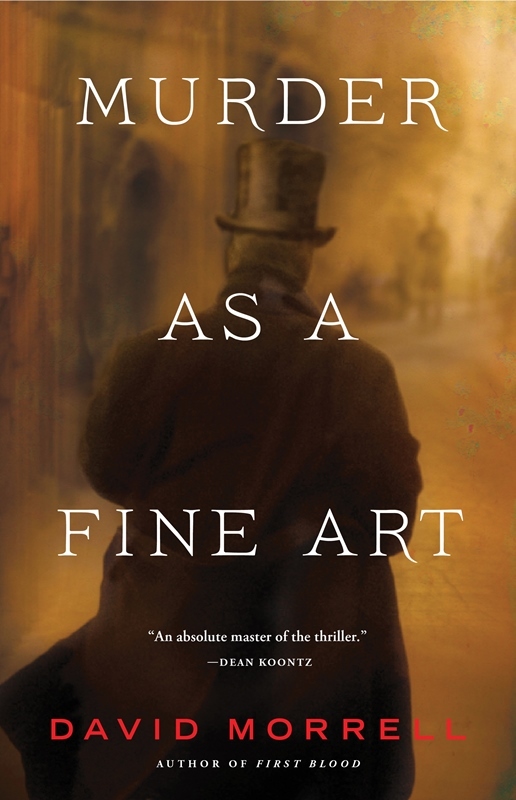 Since I love history from the Victorian Era, and have always enjoyed the classic mysteries and dark literature of the 19th Century, I was excited to read this novel. I was pulled into it page by page, immediately from the start when it began with a brutal murder and a look into the mind of a killer. The action is exciting, the character development is spot on, and the continuation of the plot thickening throughout each chapter all works well together to create a page-turning novel. It reads like classic literature. His look into mid-Victorian London, the struggle between the classes, the glimpse into the psyche, the introduction and beginning of professional crime detection….a mystery written amid the sickness, sights, sounds, smells of the crowded Lond streets…..the addictions and vices….creaky carriages, cobbled streets, street lamps, and alley ways….all used to allude to the human condition confounding England during this dark period while we are held in suspense deciphering as if we are a “sherlock holmes” ourselves. It was extremely interesting how Morrell came across the work of Thomas De Quincey, who wrote true-crime essays during the mid-1800s and, as well, about his own opium addiction. De Quincey’s work isn’t as forefront as writers such as Arthur Conan Doyle and Charles Dickens who wrote classic novels we all can list on our fingers, but when Morrell discovered De Quincey had written thousands of works, he also realized he’d truly influenced the onset of the “sensation” novel. Uncovering new literary works is engaging to me, as much as it must have been to Morrell. Morrell utilizes De Quincey’s sensation imaging technique, mixed with particular details, to bring 1854 alive to the reader. Then he further weaves in some witty, unconventional forensic crime detection, all to create Murder as a Fine Art. Of course, his decision to utilize De Quincey as the detective was instrumental in making this book a great historical read. The fictional 1854 murders were a copycat to a murderer who committed crimes earlier in the century that were written about in an actual essay by De Quincey (“On Murder Considered as One of the Fine Arts”) so Morrell has De Quincey, with daughter Emily alongside, set-out to learn the truth. Mixing truth with fiction, or creating fiction out of truth, makes Morrell’s book a true intellectual mystery read. I am completely interested now in the 1811 Ratcliffe Highway murders, which were the most notorious mass killings of their day. 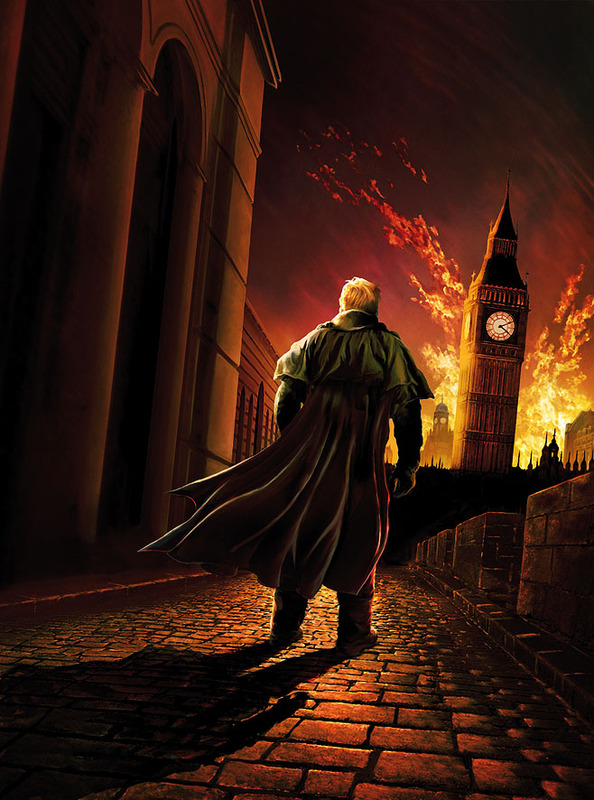 They caused so many citizens living in London and its outskirts to live in fear since they were more random murders, unlike the later and more frequently written about Jack the Ripper cases, which targeted prostitutes. I was thrilled that Morrell brought light to De Quincey and the 1811 murders, as well as the true lifestyle of mid-Victorian Londoners. Morrell did a supreme job of creating and setting scenes using various points of view in his writing as well. I think that using Emily’s voice through her journal entries really added to the novel and gave it a classic feel. It was a novel written in an historical voice, not just in a historical setting. Still a complete model author for any creative writing professional, especially thriller, suspense, and action genre writers, Morrell stands the test of time by utilizing his seasoned skills as a base and starting his own line of historical mysteries. Readers will be astounded by Morrell’s Murder as a Fine Art and crave more historical detective stories in this vein from his pen. I hope he plans on writing futher novels such as this, even using De Quincey or Inspector Ryan, because I am afraid it will be demanded of him! He needs to fill our reading requirements as quickly as possible! His stirring details, witty humor, sensationalized action, beautiful and emotive prose, and historical depth will leave you settling in and not wanting to arise until you’ve completely finished the novel hours later. This is truly another historical favorite of this year for me and I’m certain it will be high on my list at my year end review of the top reads! I welcome more historical thrillers from David Morrell! 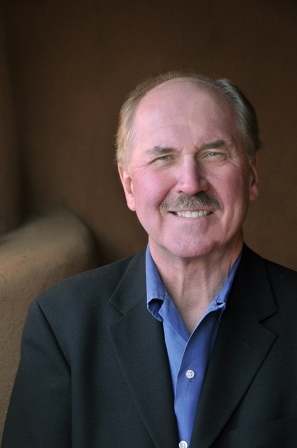 Please don’t miss my exclusive interview with David Morrell tomorrow, May 14!! And there’s a giveaway of this exciting novel!! David Morrell is a Canadian novelist from Kitchener, Ontario, who has been living in the United States for a number of years. He is best known for his debut 1972 novel First Blood, which would later become a successful film franchise starring Sylvester Stallone. He’s written numerous novels and been an Edgar, Anthony, and Macavity nominee as well as a three-time recipient of the distinguished Stoker Award from the Horror Writers Association. The International Thriller Writers organization gave him its prestigious career-achievement Thriller Master Award. His work has been translated into twenty-six languages. More recently, he has been writing the Captain America comic books limited-series The Chosen. Thank you to Historical Fiction Virtual Book Tours! I’m adding this one to my TBR shelf!! I read David Morrell’s CREEPERS a few years ago and know I will enjoy reading this one ! Sounds like a real page turner ! Pingback: Exclusive Interview with the Master of Thrillers, Author David Morrell | Oh, for the HOOK of a BOOK!